Carol Anthony and her fiancee Ian Rush in Dublin for the Sean Cox Gala Fundraiser . Former manager and Liverpool player Sir Kenny Daglish arriving The Intercontinental Hotel in Ballsbridge for the Liverpool Legends dinner and auction in aid of injured Liverpool supporter, Sean Cox. Rhona Blake and her husband Charlie Murless arriving The Intercontinental Hotel in Ballsbridge for the Liverpool Legends dinner and auction in aid of injured Liverpool supporter, Sean Cox. Film director Jim Sheridan and his wife Fran arriving The Intercontinental Hotel in Ballsbridge for the Liverpool Legends dinner and auction in aid of injured Liverpool supporter, Sean Cox. Former Republic of Ireland and Liverpool player Phi Babb arriving The Intercontinental Hotel in Ballsbridge for the Liverpool Legends dinner and auction in aid of injured Liverpool supporter, Sean Cox. Football legends Robbie Keane, Mick McCarthy and Kenny Dalglish walked the red carpet for a special gala dinner in aid of Sean Cox. Tonight’s gala event takes place ahead of tomorrow’s much anticipated charity football match at The Aviva. Former Republic of Ireland and Liverpool player Robbie Keane arriving The Intercontinental Hotel in Ballsbridge for the Liverpool Legends dinner and auction in aid of injured Liverpool supporter, Sean Cox. Other famous faces included film director Jim Sheridan, Ireland boss Mick McCarthy, retired Ireland footballer Phil Babb and Liverpool legend Ian Rush, with his partner Carol Anthony. More than 300 guests attended the event in the Intercontinental Hotel in Dublin’s Ballsbrdge, to raise funds to aid in the recovery of father-of-three and Liverpool fan Sean Cox. Speaking at the event, Mr Cox’s wife Martina said the outpouring of support for her husband has made coping with last year’s tragic event a lot easier. “We celebrated Sean’s birthday on Tuesday and, in a special and emotional way, it feels like tonight is his party . “I know he would love to be here and meet with so many of his sporting and entertainment heroes. Mrs Cox added that she is sure her husband is greatly looking forward to today’s match. “I know he will be as overwhelmed and emotional as me when he experiences the crowds and watches the teams run onto the pitch,” she said. A charity auction was due to take place tonight at the event, and it’s expected to raise more than €15,000 for the Dunboyne father’s rehabilitation. 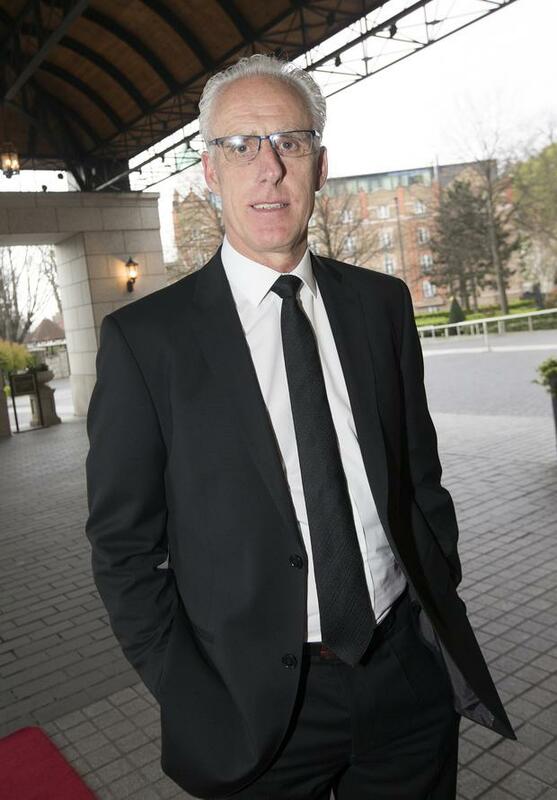 Republic of Ireland manager Mick McCarthy arriving The Intercontinental Hotel in Ballsbridge for the Liverpool Legends dinner and auction in aid of injured Liverpool supporter, Sean Cox. Some of the items on offer included: a signed Liverpool jersey by Mohamed Salah, a trip to an Ireland away game in the Euro 2020 qualifiers, and a dining experience with rugby legend Brian O’Driscoll. Meanwhile, Mr Cox has addressed the public for the first time and offered a message of thanks to the thousands of people wishing him well. The Sean Cox Rehabilitation Trust, a charity set up in his honour, released video earlier today of Mr Cox thanking the public and giving a thumbs up. “If you are one of the thousands who organised/attended a fundraiser to support Sean, Sean Cox has a message for you,” the charity said. Liverpool FC Legends will take on a Republic of Ireland XI Legends selection at the Aviva Stadium this afternoon to raise money for the Meath man’s rehabilitation. Kenny Dalglish will lead a star-studded Liverpool team against an Ireland side featuring Robbie Keane and a host of big names. Mr Cox, from Dunboyne in Co Meath, suffered life-changing injuries after an unprovoked attacked by Roma supporter Simone Mastrelli outside of Anfield Stadium on April 24 last year.